This week I would like to share a unique experience I had after an invitation for an extraordinary exhibition by the Turkish-American Association (TAA) reached my hands. The title was simply "Felt Exhibition." Of course the very name intrigued me. Felt is an interesting compound, made by compressing animal fibers, especially wool, under heat, dampness and pressure - with acid and soap - to create a 100% organic material. Lambs wool is dyed with organic colors made from plants so they are constant and don't fade in time. It's a material with many uses, and the colors are useful for handcrafts. Felt has played a surprisingly important role in Anatolian and Turkish culture, being one of the oldest handcrafts brought to the region in the 11th century by Turks migrating from Central Asia. The exhibition was full of color and warmth. From the moment I walked into the exhibition hall I felt as if I was stepping into history. 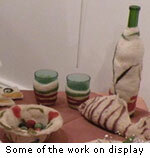 Pillows, portraits, vases, cups - seemingly anything you can imagine that can be made with felt was there. I had the opportunity to talk with one of the artists, Füsun Acartürk, a Professor at Gazi University's Faculty of Pharmacy, who found this group on the internet. As she pointed out, the exhibition was a product of one year's hard work. When I asked what drew her to this art form, she said it all started one day after watching a documentary about felt. "The documentary affected me a lot, emotionally. Afterwards, I learned that there actually was a special group in the TAA. So I started the course to see how it was made and then, here we are, in the exhibition." With the variety of objects exhibited, I asked if she had a favorite that she liked to make. For her, making tableaus is more enjoyable than other objects and she feels that they look nicer in the end. She works with reds a lot, and she explained that she finds it more attractive than other colors and so the tableau sells itself. For her, working with felt is like a therapy: "When I make felt I feel very calm, peaceful and purified." I also spoke with the teacher of the felt course, Yaşar Cengiz Çınar. He works for the Government Treasury and started making felt as a hobby. As this is their first exhibition, he said their aim is to give life to the felt handcraft again, to remind and teach the young generation about felt. They have tried to show that felt could be made in various forms and dimensions and that it is a very flexible material. At the end of our conversation he thanked me for my interest on the subject and advised young people to be aware of the felt tradition and the art that has come from it. I salute you all until my next article.